The title is taken directly from the script I wrote for this comic. HEY EVERYONE it’s been a while since I asked you all to drop us some comments. We have a few REGULAR, ULTRA-LOYAL fans who are, frankly, much cooler than the rest of you because they comment all the time. Want to be more like them? Then comment, already. It’s easy and we feed on the attention. After I got this script from Victor, I kept adding “but with intense sadness” onto everything. If you don’t comment, it’s ok. I’ll keep drawing this comic. But with intense sadness. 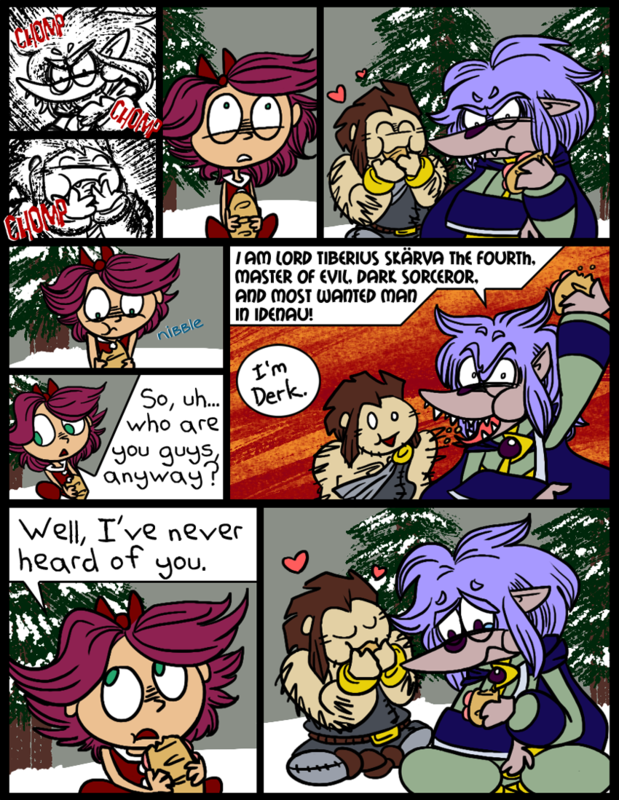 Between “the girl” and Derk, this comic is just adorable! Oh. Man. You haven’t seen anything yet. As much as Derk cares about Skärva, he really wants someone around who’s not so… evil all the time. I’m sorry for being so not-cool for not commenting at all! Please forgive me! D: In fact I have been following this comic since it started, looking every day there’s an update. You can consider me a fan now. I’m very impressed with this comic so far, I really adore the characters. And the art, of course. Keep up the great work! Man, you are SO cool, Renee. Thanks for commenting. Thank you! There are going to be so many more characters and hopefully the art will only get better and better, too. Don’t tell Skarva, but he looks cute when “intensely sad”. I’ve been following you guys on google reader, so sorry about the lack of comment-ness. Will try to do better in the future. Oh, don’t worry about it! It’s just that comments really make our days, is all. And I love your username, by the way. Three things that are adorable. 1) The girl’s little nibbling 2) Derk’s intro. XD It’s just like, “I’m Derk. :3 [nom nom nom]” 3) Skarva’s sad face. Yeah, I don’t know if Derk simply didn’t feel the need to say his last name or anything more about himself, or if he just couldn’t keep that sandwich out of his mouth for more than 2 seconds. I’m making the latter choice official canon now. Twi, you know that I would never subject my characters to bandwagons and memes. Shame on you! To be honest, I have considered it already. Guess I have to do it now! And finally, it was. Ten comics later, the rumblings of Skärva’s tummy were finally put to rest. After he terrorized a poor, hungry little girl into giving up her only food, and laughed heartily as she cowered in fear and watched him and his lackey rabidly devour their prize. …At least, that’s how he told it later. Hi! I’ve been reading your comic for awhile now and I have to say it is pretty awesome! It’s actually in my top ten now. Keep up the good work! Eeeee!!! I mean – ahem. I need to learn some professionalism. Thank you very much, and I hope you will find that it only gets better. I absolutely love the first two panels. Eating has just never looked so awesome, not even on Epic Meal Time. That poor little girl can’t do anything but stare in shock! Also, I have a feeling Skarva isn’t all of the things he boasts he is, what with being chased away by Canadi- *ahem* Northern Idenians, having his arm broken by that wizard with the insanely huge eyebrows, and now someone flat out says she’s never heard of him. But don’t tell him I said that… I might end up transformed into a shrubbery. Well, to be fair, there’s a reason why the little girl has never heard of him. …But that’s just one of his problems. He IS famous, and tries his hardest and ought to be pretty competent. The gods just enjoy screwing him over. But I bet you’d be cute as a bush, just like they were! Ahaha, not quite. We are the gods of the gods. Now that’s power. GRAH. Fine. I’ll comment so I can be a cool kid too. I found this comic through an advert that I clicked out of random curiosity, and I have to say that it is shaping up to be one of my favorite webcomics. Looks like I’ll have to add you to my DA watch list too, now that I know you have one. Welcome to the cool kids club! You can sit with us at lunch now. Seriously, though, thank you so much! And thanks for that! You can find some bonus Fourth stuff there that I’ll probably put up here too eventually, as well as all my various fanart, blabbing about my life, and other random stuff I do. And I love making friends on dA! I’m new, and I must say, that this comic looks really promising. It looks like it’s going to be a lot of fun. I’ll be following, but I won’t promise to comment on every page. Yay! Thank you so much! :3 We update every Monday, Wednesday and Friday at precisely 12:01 a.m. our time (central). this was chilling……yeah Ive over used the word chilling and I know it,does “shocking”work better for you? Well but then you’d have to change your name to King Lightning or something. =T I tend to try and catch up to the latest comics before commenting. Anyways…. I’m loving this comic to death. The characters, the story, the lols…. I’m finding myself rather attached to Mr. Master of Evil. =V He’s totally likeable. Oh, your comment makes me so happy! Thank you so much! It’s only going to get better and better, I promise.